The Regiment was raised in 1680 and it is believed that King William III (ruling between 1689 and 1702) granted the Lion in recognition of the fact that the Regiment was one of the first to ally with him when he landed at Torbay in 1688. As its 'ancient badge' it was confirmed to the Regiment by the Royal Warrant of 1st July 1751. A Lion first appears on the Regimental Colour of 1751. The Lion of England was first used as a badge around 1774 on the officers and other ranks shoulder belt plates, and the shako-plate from 1800, on the buttons from around 1808 and on the officers forage cap from 1834. From 1872 it was worn as a collar-badge and from 1896 as the Regiment's cap badge. The Red Diamond - The origins of the red diamond are somewhat obscure. 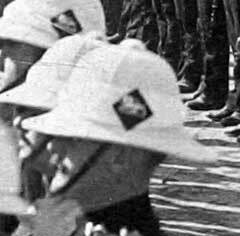 In 1901 at the time of the South African War (Boer War) the slouch hat replaced the forage cap and The King's Own badge was worn on the left of the hat with a red diamond backing. In 1904 the shape of the backing was changed to a rectangle and in 1912 the colour was changed to blue. The red had appeared as the backing colour the the helmet badges in 1880. 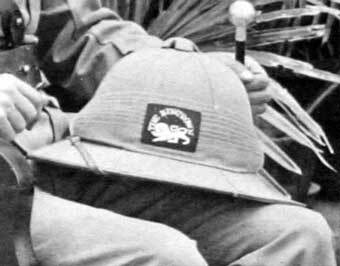 Slouch hat worn in the South African War with diamond patch, badge and wording 'Lancaster'. There are claims that the embroidered shoulder titles were removed from tunics and applied the headwear, and when this was done to a scarlet uniform, it would of course provide a scarlet/red backing, cut to the shape of a diamond. Men of the Volunteer Battalions on parade at Bowerham Barracks, Lancaster, ready to depart for the South African War in 1900, with tropical helmets and patches with "V" above the word "Lancaster" on the sides. Tropical Helmet with red cloth and embroidered badge, 1st Battalion, King's Own, circa 1908-12. White tropical helmet with red cloth diamond and metal badge, 1st Battalion, King's Own, circa 1908-12. From 1970 to 2006 the Lion of England was worn by the soldiers of the King's Own Royal Border Regiment, but surrounded by the Laurel Wreath which marks the conspicuous part played by the 34th (Cumberland) Regiment of Foot in the retreat from Fontenoy in 1745. 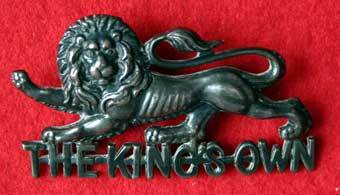 The 'Staybrite' King's Own Border cap badge included a crown, although incorrect, this was to connect the lion with the laurel and allow the slider/bar at the rear. 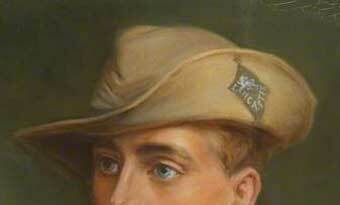 The embroidered cap badge of the King's Own Royal Border Regiment did not feature, correctly, the crown. With the creation of the Duke of Lancaster's Regiment the Lion of England has been relegated to being the collar dog. In 2015 the Duke of Lancaster's Regiment re-introduced the Lion of England badge as a Tactical Recognition Flash to be worn on the right sleeve of combat dress. The Regimental title has an interesting history, and has been changed many times. In 1680 the Regiment was raised in London and Plymouth as The Second Tangier Regiment or The Earl of Plymouth's Regiment of Foot for Tangier. In 1684 the title was changed to The Duchess of York and Albany's Regiment of Foot, but when the Duchess became Queen Consort in 1685 the title was again changed to The Queen's Regiment of Foot. In 1703, when serving as Marines, the title became The Queen's Regiment of Marines, or Royal Regiment of Marines, changing again in 1710 to The Queen's Own Regiment of Foot. With the accession of King George I the title was altered to His Majesty's Own Regiment of Foot, usually abbreviated to The King's Own Regiment of Foot. In 1743 the alternative title of 4th Foot was also used. In 1751 the title became 4th Regiment or King's Own Royal Regiment of Foot. The following year saw yet another change to Fourth (or The King's Own) Regiment of Foot, at which it remained for nearly one hundred years until in 1865 the title became 4th(or King's Own Royal) Regiment of Foot. In the 1870s the army was reorganised and Infantry Regiments were given a distinctive recruiting area. The King's Own came to Lancaster and in 1881 the title became The King's Own (Royal Lancaster Regiment). This was often shortened to Royal Lancaster Regiment and its abbreviated form was R. Lanc. R. All medals to the King's Own in the South African War (1899-1902) and the First World War (1914-1919) are marked R. Lanc. R.
In 1920 the title changed again to The King's Own Royal Regiment (Lancaster), which it remained until amalgamation with The Border Regiment in 1959, when it became The King's Own Royal Border Regiment. In 1931 a LMS railway locomotive was named "King's Own" at Euston Station.